Lists bring order to chaos, keeping the hoi polloi from lowering the tone at exclusive nightclubs and ensuring that hit men with memory problems don't accidentally snip the wrong brake lines. They also give people who don't follow the news and aren't obsessed with the personal affairs of others things to talk about – top films featuring a fruit in the title (A Clockwork Orange for number one), or top celebrities with whom I would readily fornicate if they suddenly took an interest in poor, unknown people who make up fantasy lists in bars. We love lists. That they are custom made for writers who break into a flop sweat when asked to go beyond a few sentences following a bullet point is immaterial. I don’t read non-fiction often, of any sort. Unless it’s a book written by someone I idolize (and trust me that list is short), or a topic I wish to learn about, I just don’t do it. I don’t care about a random person’s biography, or their world views and opinions on anything. But in this case, I was familiar with the Shark Guys and have actually visited their website a few times, so I figured I had to give it a shot. Lists are a fun way to pass time. They can be entertaining even, depending on the subject. However, your run of the mill “list books” or websites don’t offer much opinionated commentary, with a few exceptions. I think this is why I enjoyed Tastes Like Human so much. Their commentary for these lists was highly amusing, even on the most mundane subjects. There were a few lists that didn’t entertain me, but I think that’s going to boil down to preference. My favorites included “Top 10 Horniest Cult Leaders”, “12 Murderers and Star signs” (All famous crazies, and how right and/or wrong astrology gets things. Absolute favorite), “Top 20 First Date Suggestions” (a tongue in cheek “guide” to dating), and “5 ATM Etiquette Guidelines”. I had a lot of fun while reading this book, and to my surprise, I didn’t even need to read it alongside something fictional. 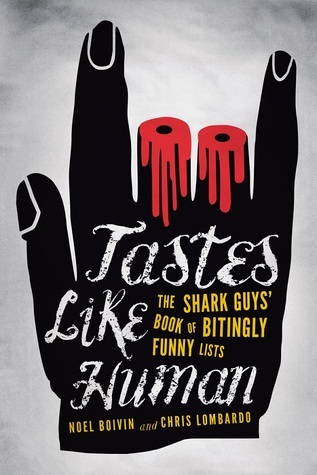 It kept me completely entertained until the last page, and I would definitely recommend it if you’re looking for a few laughs. Oh my this sounds like a nice compilations of list. I think it got me at "karaoke-inspired acts of violence". LOL.